That’s a bold statement, but true. There are a number of aerated trout lakes I fish regularly and on each and every one of them I’ve caught more large trout than I could have envisioned in my childhood dreams. 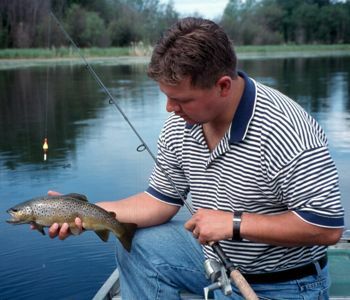 On many of them two-pound trout are common, three to five pound trout are expected, daily. The quality of the fishery varies from lake to lake because of a number of factors: stocking amounts, size of the water body, the ability of that water body to produce food and of course, angling pressure. 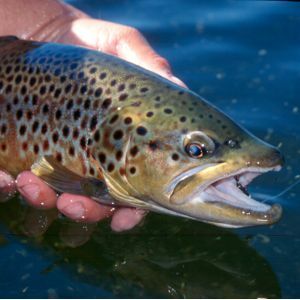 On a whole, however, aeration systems have dramatically improved the overall trout fishery in the province of Alberta. I first heard about these ultra productive lakes many years ago and my first experience fishing one was on a tiny pothole called East Dollar Lake. 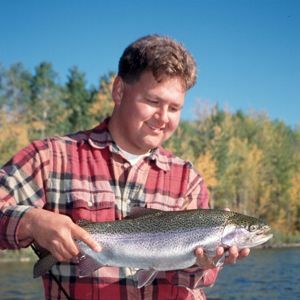 This was back in the day before Dollar was ‘discovered’ and it produced some monster trout, mostly to locals and the fly fishing crowd in the know. But since it was discovered some serious catch and keep fishing has inundated this little pothole and the overall quality has suffered. There’s still good fishing to be had at Dollar, but don’t expect the big fish of years past. I still like this lake; it’s tiny and it offers up some fun fishing for eager and willing average sized trout, and on occasion, I still catch a good one. Seeing the potential of Dollar and what it had to offer, I started paying a whole lot closer attention to which lakes were aerated. Locally, Spring Lake came on line as an aerated lake and in the past few years, the quality of the fishery has been astounding. My friends and I have caught some genuine five-pound and bigger rainbows, plus a multitude of fish over two. This is my home lake. It’s close, it produces big trout and there’s a genuine outdoors feel when I’m there. In spite of cabins lining some if its shoreline, while on the water I’ve seen coyotes, moose, deer and more bird species than I can shake a stick at. I like Spring because during summer days and evenings I can take friends out, put a flyrod with a sinking line in their hands and pull big quarter pound flies, like a bead head wooly bugger or a doc spratley. In no time the rod is bucking and they’re wearing a smile as big as Texas. There has been the question raised as to why aerated trout lakes produce great fishing and the reason is weeds. Yep, the lowly weed. In shallower lakes, which have typically been prone to winterkill, it’s weeds that give bountiful life and plenty of food to growing trout in the summer, but during the winter those same weeds die off and consume much needed oxygen. If too much oxygen is consumed the trout suffocate and die. It’s not pleasant. But with the aeration systems, which looks much like a wintertime water fountain, the trout get the benefit of heavy food production in the summer, while getting the oxygen they need by way of the aeration system through the winter. It’s a win-win situation. As a result, these trout grow big and heavy fast. 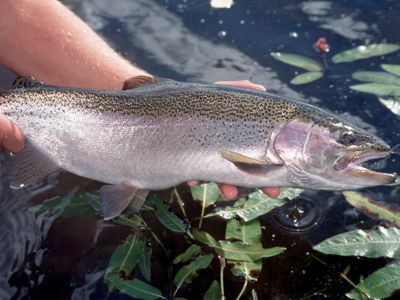 A three year old trout can weigh an astounding three to six pounds. And that’s not all. That same fish may only be 22 inches long. A feat that will never be accomplished by their stream dwelling cousins. So all these trout have to do is pretty much swim around with their mouths open filtering out food and growing bigger. And when one of these tanks hits your fly or lure, you’ll probably be hooked as solidly as me on aerated pothole trout. For the adventurous group, refer to the list of Aerated Lakes that the Fishin’ Hole website is providing and bring along the cartopper or belly boat. Fishing from a boat is better than being limited to shore for the simple reason of mobility. With a boat or some other floatation device you will be able to explore the entire lake and fish the best spots. And when you get to your chosen lake, if your experience is similar to mine, you’re bound to get into some great fishing.